SellingRestaurants presents another turn-key restaurant facility located in the upscale town of Granite Bay and priced to sell at ZERO! Yes, it will cost you nothing to start this restaurant. If you're lookiing for a high income area where the demographics are primarily upper-class white collar professionals and high income earners, then this is the location. The number of available restaurant spaces in Granite Bay are low because the community tends to support the local restaurant owners if they produce good product with great service and a fair price. This restaurant needs very little in order to open it up. All the equipment is in place - hood, stove, oven, prep-table, counters, point of sales system, reach-ins, hundreds of nice chairs and dozens of table, and the list goes on. The building is fairly new and shows well. There is an outside patio area allowing you to take advantage of the wonderful night weather the area offers. You'll get 7-8 months of use on the patio in this area. The dining room seats hundreds with a total of 2,750 Sq. Ft. inside and a large outside patio included in the rent, The total monthly rent including NNN of $8,525. Yes, the rent looks high, but keep in mind it includes the leasing of all the equipment in the restaurant plus the existing infrastructure. If you were to buy the equipment and build-out this restaurant it would cost you $500,000+. The lease already has this all factored into it. This is a beautiful facility and you've got to see it to appreciate it. This is a destination location and will require an operator who knows how to work the community and businesses in order to grow their business. There are 10's of thousands of employees within a couple miles of this location, so lunches will be strong. There are plenty of upper-class homes in the area with annual incomes I'm sure that are in the 6 figure+ area so dinners will be strong. Of course it depends on your skills to achieve these results. The landlord is willing to do a 5 or 3 year lease plus options. This restaurant is litterally open to any concept you want except fast food. So to see it, just signin or register and select the orange button titled "want Name and Address" and you're on your way to a great deal! 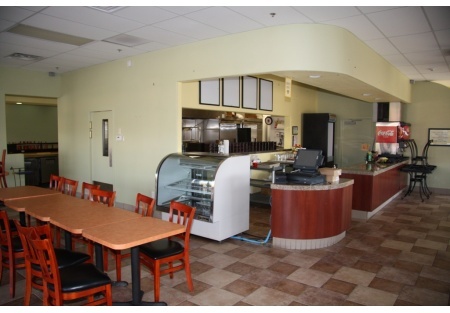 Absolutely Turn-Key Restaurant - Just get Health Inspection Completed.